The long hot summer is finally over and it’s time to chill! Come kick it with friends at a groovy gathering filled with the sensational sounds and inspiring artwork that has come to define #TnTCafe. Acoustic duo project started in 2010 by a solo artist TAMA TSUBOI,Sean Harada from THE STONE SUN and percussionist Naoki Kawashima as THE STONE SUN ACOUSTIC. Shortly after Naoki Kawashima left the band in 2011, Tama Tsuboi met KOJI SONODA, RYAN MIZUNO, KAI PETTIE, and GOW KUMAGAI, who are the current members of Shamanz. Shamanz sonds are inspired by Tama Tsuboi’s influences from Flamenco, Latin, Alternative, Jazz and World Music. 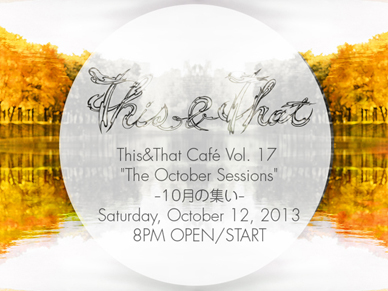 Guitar and vocal duo SAKURA & CLYDE make their Japan debut at This&That Café. Stephen Redmond is an artist from the UK who dabbles with murals and live painting, animation, sculpture and various creative pursuits.Recurring themes in his work include astronauts and dinosaurs, and sometimes the inexplicable combination of the two! Roarrr) and CONTROL parties. Paul is English and Sebastien is French Canadian, both based in Tokyo for about 8 years. Ricoh’s new camera, “Theta” is the world’s first mass-produced imaging device that encapsulates fully spherical scenes with one shot. The Theta hasn’t been released yet in Japan, but we’ll have a couple of them on hand so you can get a sneak peak at this revolutionary new device and shoot your own spherical panoramas onsite.